Partnering with a highly resourceful third party logistics group has numerous advantages. Regardless of your shipping and distribution needs, a 3PL will create an efficient supply chain and optimize the logistics of your business. Any company producing and selling goods on a domestic and/or global scale needs to consider partnering with a 3PL to reduce their costs. According to industry studies, companies using 3PLs reported a 9 percent average cost reduction for their shipping operations. These companies also experienced a reduction of 5 percent in inventory costs and a 15 percent reduction in fixed logistics costs while order fill rates improved. These substantial savings occur because 3PLs take on the responsibility of providing warehouse space, transportation, experts on the logistics process, EDI and other technology. Companies are better off investing the bulk of their time in their own products and services rather than the complicated logistics that distribute their goods. 3PL companies make up a multi-billion dollar industry because they possess a vast resource network with more advantages than an in-house supply chain. Their resource networks give them the ability to optimize every facet of the supply chain in the most cost-effective way possible. 3PLs use their relationships to receive volume discounts for their clients to reduce overhead costs and ensure timely deliveries. There is no shame in outsourcing your supply chain and logistics operation to a 3PL that will help your business flourish with resources unavailable to you. 3PLs not only cut costs for manufacturers running their own shipping operations, but they also remain experts on the constant changes of federal transportation regulations in the United States. This also rings true for the regulations of foreign governments for manufacturers wanting to expand globally. 3PL companies deal with all of these complex regulations to make it effortless for businesses to enter these markets. It’s far too risky of an investment for a manufacturer shipping their own goods to test a foreign market. The challenging variables involved are too much to take on in-house. A wide range of risks accompany shipping operations and other aspects in the logistics process. Partnering with a 3PL eliminates numerous liabilities a manufacturer would be susceptible to with an in-house logistics operation. They would no longer be financially responsible for an entire logistics workforce and the miscellaneous costs that come with it (ie. workman’s compensation, union strikes, etc.) There’s also the risk of your supply chain not performing efficiently due to the lack of resources available. As you can see, a 3PL provides all of the logistic capabilities necessary for a company to succeed, while cutting costs and liability. 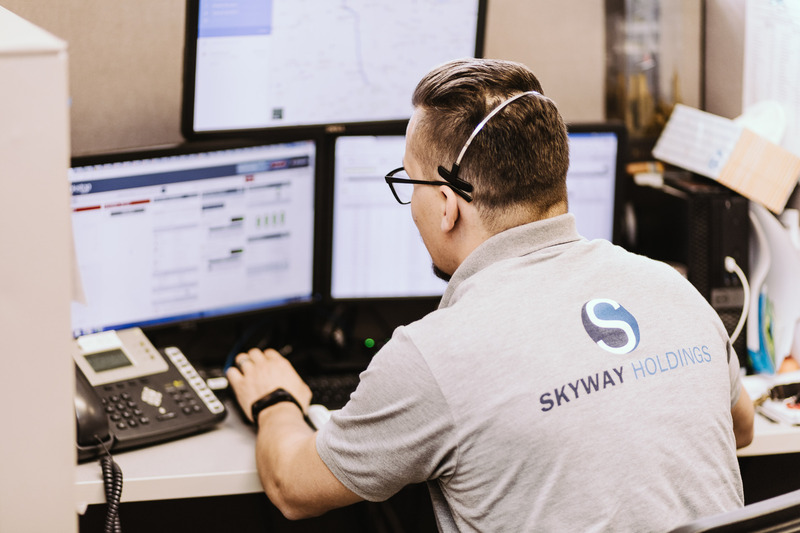 Here at Skyway Brokerage, we will reduce costs for your customers using our PCS Software that delivers information to them automatically in a timely fashion. This software manages the dispatching process electronically eliminating the need for additional phone calls, faxes, and emails. Our software manages a key component of your logistics operation and creates revenue possibilities by freeing up your company’s time with its capabilities. In addition to reducing costs for your company, it also reduces costs for your customers and carriers. If your company’s dispatching process is too expensive or ineffective, call us at 224-222-0488 or complete our contact form here.